A plane that crashed into a California neighborhood and destroyed two homes was carrying husband-and-wife pilots and their grown daughter, and a mother and daughter who were friends of the family, relatives said Wednesday. Stacey Pierce was one of two survivors of the crash, but is still in critical condition, her family told NBC Bay Area Tuesday night. Her parents, Nouri — believed to be the pilot of the twin-engine Cessna — and Dana Hijazi, were two of the three people killed in the crash, the family statement indicated. All three are San Jose residents. "You see these things on TV and you don't think that this'll happen to your family," said Christy Crown, Pierce's sister-in-law. "It's surreal watching it, knowing these were members of our family." Meanwhile, Brandon Fareles of San Jose said his 22-year-old sister Adine was among the dead. Their mother Sylvia survived the crash, but suffered severe burns that required surgery. The two women who survived were ejected from the plane before being rescued and rushed to the hospital, Riverside Fire Department Chief Michael Moore said. Authorities have not yet confirmed the victims' identities. "He was an extremely experienced pilot, which was his hobby, his passion," Crown said in a statement on behalf of the family. "We want to say how incredibly devastated and heartbroken we are and still trying to process everything." The group was returning from a weekend cheerleading competition at Disney California Adventure Park where Adine's younger sister competed. The Union Middle School student arrived safely back in San Jose by bus with the rest of her team. Pierce is the mother of children who also study at the same school, district Superintendent Denise Clay said in a statement Wednesday. Before the crash, the smiling members of the team celebrated their first place trophy win at the weekend's national cheer competition, according to the group's Facebook page. Adine Farelas posted that she was "having a blast' with her mother and Pierce and looking forward to heading to the Disneyland park where the event was to be held. The Union school district is in mourning and has grief counselors on hand to help the students cope. "Our hearts go out to the families and the friends of the victims," Clay said in the statement. "It is times like these that, as a community, we must rely upon one another for strength." Moore said the Cessna 310 had just taken off from Riverside Municipal Airport, less than a mile away, and was bound for San Jose. The plane crashed under "unknown circumstances" shortly after 4:40 p.m. Monday, igniting an inferno that destroyed two homes and slightly damaged two others. "Upon impact, the plane pretty much split apart," Moore said. Juan Cortes and his son, Jonathan, were installing fencing when they saw a low-flying plane make an awkward tilt and go straight down into a neighborhood. "I saw the smoke, the black smoke," said Cortes, 42, who raced to the scene in a truck with his son and tried to help. People were screaming in the street, and he saw a woman pulled away from the flames. "She was alive because she was screaming, 'My daughter! My daughter!'" he recalled Tuesday. Traci Zamora, 38, rushed out of her home and around a corner to find a house engulfed in flames. Then saw a victim emerge, part of her body ablaze. "She just came crawling right out of it onto the front lawn," she said. "Her lower body was on fire." Despite the inferno, no one on the ground was hurt. "The airplane itself is in quite a few pieces, spread over a debris field" of about 100 to 150 feet, said Stephen Stein, an air safety investigator with the National Transportation Safety Board. Investigators have received conflicting accounts of what may have led up to the crash and were continuing to interview additional witnesses, Stein said. Weather in the area 60 miles east of Los Angeles had included rain, but there were no immediate indications of what caused the crash. NTSB investigators will examine environmental conditions, including the weather, along with the pilot's history, flight records and the physical components of the aircraft, Stein said. 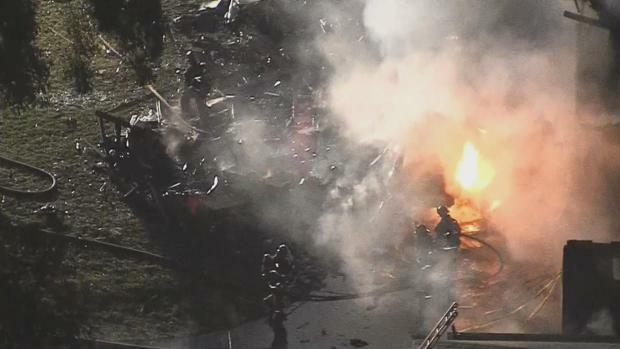 A Palo Alto flight instructor who watched a video of the Cessna crashing into the homes told NBC Bay Area that he suspects that one of the two engines failed, forcing the pilot to react quickly. The tail number of the aircraft was N1246G, according to a government official with knowledge of the investigation who spoke on condition of anonymity because the official was not authorized to release the information until next-of-kin have been notified. Federal records show that number is assigned to a twin-engine Cessna 310 registered to Nouri Hijazi. Telephone listings for him were either disconnected or went to voicemail. Moore did not provide the name of the cheerleading competition, but the Jr. USA Nationals for girls 15 and under was held at Disney California Adventure Park over the weekend. Officials with the competition did not immediately return calls Tuesday. For many in the neighborhood the crash announced itself with a tremendous boom that rattled their houses like an earthquake. H.L. Reyes, who lives about a quarter-mile from the crash site, said she felt the ground shake and saw plumes of black smoke. "I thought it was a possible earthquake, and we heard all the birds just suddenly react outside, too," Reyes said. "This was just like a nightmare coming true." Hector Jimenez, 19, was playing video games at home when he heard a loud boom and saw black smoke. "It's just sad that it happened here," he said. "It makes me nervous living around an airport. That's one of my worst fears, having this happen."